I have a lot of decks in all kinds and genres but this one is among the bizarre ones I’ve got (and that’s not an understatement!) For those wondering what the title means Tare is a slang word meaning mad insane ‘out-of-their mind’ a title well chosen when you look at these 22 cards. It was published last may by “Le Dernier Cri” (where it is still available) who specialize in strange creations and in recently also published a tarot by Marcel Reujters, and that is now sadly Out Of print – it has in common with that deck that they are both published in a limited edition (this one has only 200 decks) both are hand screened, have similar sizes and have a similar flap-thingy that contains them. Thus far what the similarities go. 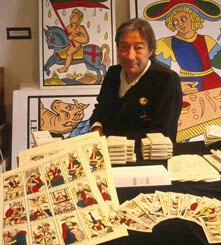 Jean-Claude Flornoy passed away on 24th of may - a very sad thing, a great loss for the world in general and the world of tarot specifically. My thoughts go also out to his life companion Roxanne. Jean-Claude, you are and will be missed - peace to you. It's always good news when a deck comes back into print, especially when it's one i didn't have in my collection yet. First published in 1995 and then in 1998 this lush colorful deck is at it's third printing now (the 2011 version is now called “The Polish Tarot”) and i'm sure it has many years and potential in his future.It is a deck that has personality and dares to stand out of the crowd, like that eccentric aunt we all loved, that everyone was looking at and that loved the attention! Subtly hinting towards the TdM, non-scenic pips, (almost) psychedelic effects, golden borders bilingual titles (Polish & English) what's not to like in it - I love it! The deck, that was published in a small edition of only 200 decks by Mondo Bizzaro in collaboration with Elsewhere Factory Lab, consists of a Tarot deck of 22 cards plus 3 information cards, edition is already nearing the point of being sold out. For these interested in names, here are the artist who collaborated and what card they created: Hogre (The Magician), Antonio Guzzardo (the High Priestess), Valeria Crusade (The Empress), Simone Tso '(The Emperor), Jb Rock (The Pope), Nike Alghisio Brass (The Lovers), Infidel (The Chariot), PU: RE (Justice), Paul Petrangeli (The Hermit), Diamond (The Wheel), Alessandra Fusi (Strength), Elena Rapa (The Hanged Man), Bafefit (Death), Mark Rea (The Temperance), Michele Guidarini (The Devil), King of the Herring (The Tower), Saturno Butto '(The Star), Luisa Catucci (The Moon), Genuine (The Sun), Luisa Montalto (The Judgement), Francesco D'Isa (World), Gaetano Leone (The Fool). Who said tarot and 'hard' science don't mix? well lo behold and rejoice science AND tarot loving geeks and nerds (and no I didn't use those terms in a denigrated way) because here is the Tarot of Physics, all science all tarot and that 78 cards long. Clean schematic minimalists images on pale yellow/beige background, that remind of high-school science textbooks, are used to link a different theory or application from physics to a tarot interpretations . In sync with the theme the suits have been renamed to Energy, Space, Time, and Matter. As a special feature for those who want to use them the cards are only laminated on the backs so one could add notes, colors or anything you want to them. The Peacock tarot was created by mixing real persons in 21st century dreamlike settings with digital collage and editing techniques without making each card overly heavy or worked upon, yet giving it a very rich and strong look. Set up as a meditation deck for those studying the tarot and also to be used for tarot readings this 22 cards deck gives a contemporary look to the age-old Tarot archetypes.